Full length blank for positive feeding. 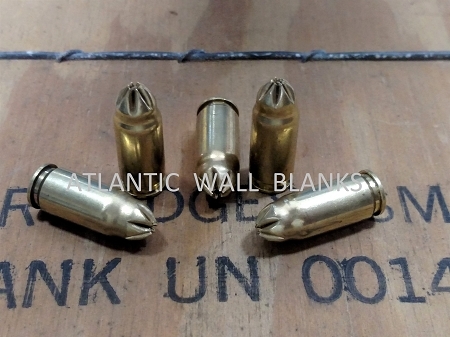 Great sound / flash for all .45acp caliber sub-guns. Recommended load for military reenactment use to prevent excessive wear on weapon. Will work in "Tommy Gunner" & Philadelphia Ordnance SBR barrels. .156 - .171 recommended BFA on 16 inch barrels and .187 - .218 on SBR's and 10 inch barreled weapons. Design will work in both military and commercial M-3 Grease Guns.